Every year I make gallons of sparkling lemonade as I’m blessed with a Meyer lemon tree that produces fruit nearly year ’round. I don’t really think about it — it’s just what I serve. After experimenting with berry shrubs last summer, I could hardly wait to try my hand with autumn and winter fruits. Apparently I’m not alone on this adventure. Specialty Food Magazine just published an article on the popularity of the sour (I prefer the word tart) flavors that were very popular in the US until sugar became more available and less expensive. The trend is driven by concerns over the negative effects of a sugar-heavy diet and a greater commitment to good health as well as by those of us who are willing to explore new ways to use foods and flavors and expand our boundaries (which I am except when it comes to chocolate-coated grubs and other oddities). I do find it exciting that fermented foods like kefir, bitters, shrubs and tonics are gaining popularity as are sour cherries and berries and other “old fashioned” flavors. Have you noticed how food trends and recipes are recycled — what’s long forgotten is once again the next best thing? Except it often reappears transformed. As an urban culture obsessed with food, we have access to endless ideas and techniques to tease out the best. I especially noticed this about the trending popularity of shrubs. Shrubs are an old beverage. Old as in 1500’s Renaissance era old, maybe even older. The word comes from the Arabic shurb, drink and/or the Hindi Sharbat, a brightly flavored syrup made from fruits or flowers and herbs, blended into cold water and enjoyed as a refreshing beverage. When I was growing up my mother talked about drinking raspberry shrub at her grandparents’ farm in Ontario, Canada. While I adored anything raspberry, I couldn’t get past the vinegar, a key ingredient in shrubs. She said it was such a refreshing drink on a hot day. I wondered how anything containing vinegar could possibly be refreshing. Drinking something as sharp as vinegar on a hot day — really?? Fast forward to the current cocktail trend. For the last several years I’ve watched bitters, tonics and shrubs evolve to near rock star status in blogs, natural food stores, tony bars and upscale restaurants. I flirted with making it, but held off until a recent blog on Food 52 brought me to the cliff’s edge. I jumped…and I’m sooooo happy I did. As the name of this beverage implies, it is made from the deep crimson or magenta calyces (sepals) of the roselle flower: Hibiscus sabdariffa. It is drunk either hot as a tea or cold as a beverage pretty much worldwide, though the name varies from region to region. In Mexico and Latin America it is known as Flor de Jamaica, Rosa de Jamaica or just plain Agua de Jamaica. On the other hand, in Jamaica it is known as Sorrel. In Australia, Roselle. It is equally popular in much of Asia, the Middle East and Africa. 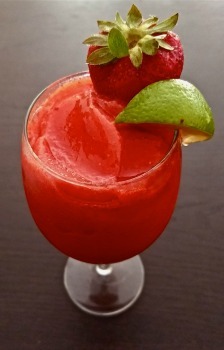 To a lesser degree it is drunk in Europe and the US, though in California it is sold as an Agua Frescas in Mexican restaurants. I first had it in Mexico and later, Guatemala and it has been one of my favorite go-to summer beverages ever since. In 2011 I went to Italy with several friends, and we spent a week in Cinque Terra, Sorrento and the Amalfi Coast. As a dedicated lemon user, I was charmed by the Italian’s devotion to their precious harvest. In Monterosso there was a weekend fair dedicated to lemons. When I walked through the town very early in the morning, there were baskets and boxes of lemons waiting for someone to bring them down the hill. We sampled several favorite family lemon tarts and cakes and drank Limoncello as the fair got underway. Living in coastal California, our summers come twice — it gets hot in May, then it remains cool and often foggy while the inland valleys are hot. When the valleys cool down, we have our second summer, usually in September. True to form, this September warmed up and I made this delicious beverage twice for friends. If you are unfamiliar with lassis, they are a traditional Indian yogurt-based beverage designed to refresh and to cool you down. They can be served any time of day or in the evening. This is a sweet lassi which also contains rose water an ingredient used in beverages and desserts in India. If you don’t have rose water, don’t worry; it’s not essential. This is a full-on eggnog that features a slew of tropical spices, plus rum, sugar, vanilla and candied orange peel. We can only imagine how expensive this beverage would have been in the 1700s. A simple and thirst quenching iced tea for summer! If you’re from the South, this cooler is known as “Half and Half.” An unbeatable combination of iced tea and lemonade, this classic beverage helps refresh you on the hottest of days!